During Diwali, the festival of lights, I took a nighttime boat ride on the Ganges River to watch all the different festive activities on the various ghats. The boat was chartered by a group of Sanskrit scholars of European origin and they brought along local Sanskrit scholars and a dozen European and American graduate students as well as the extended family of the boat owner. As scholars they wanted to get past the 3 km of presentations done for sake of the tourists and out to the ends of the river where the traditional practices took place. In the chilly evening of moon light, we floated past each ghat, each gaudily strewn in electric lights, each having its own temple and cultural personality. Those in the boat translated for me the songs and chants we heard, letting me know what was Sanskrit, what was Hindi, what was traditional and what was the textual sources. 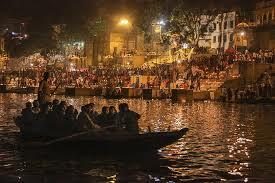 In the midst of the lights and sights of the shore illuminating the darkness of the river, I turned to one of the local Sanskrit scholars and asked: What happens when they make a mistake in the performance of the ritual? What happens if they make a mistake in the chanting or one of the lamps go out or if they do not light the correct number of lamps? The Christian graduate student sitting next to me says: don’t make fun, your ridiculous. However, the Sanskrit scholar said they would have to perform a special ritual to correct the mistake. They don’t usually make mistakes because they are all well trained, but when they do it would require an offering. However, not a major one since the mistake was unintentional. Hinduism treats ritual mistakes as needing atonement and distinguishes between types of mistakes and the intention of the mistake. In contrast, if one makes a mistake in a Catholic Mass, one just repeats or corrects the mistake. Even if one spills the chalice, the concern is desecration of the wine and its retrieval, not with needing atonement for doing the ritual wrong. However, Hinduism and Judaism are concerned with the exact practice of the rituals or else it is considered a mistake. The joke would be lost in Banaras where rituals need to be done in very specific ways. The priest must light either 51 or 101 flames or else the ritual is not valid, the lights have to be of a specific kind, they have to be pure, the area needs to be pure, the chants must be exact and the gestures and motions of waving the lamps must be the exact sequence or else one has not fulfilled the ritual. Everything used in ritual needs to be consecrated and purified or else it destroys the ritual. Hindu ritual distinguishes between items unusable due to impurity as opposed to those that have a defect, similar to the distinctions in Jewish law between a neveilah and a terefah. An animal that is a nevelah imparts ritual impurity, whereas a defective terefah from an improper slaughtering does not. One could also have a productive Hindu-Jewish discussion about feces and ritual. The Talmud and the Shastras both bans rituals around human and cat feces, but neither one worries about cow droppings since they do not smell. Neither one influenced the other one; rather the logic of not doing ritual around smells creates a parallel. Both worry about animals dying or running away between consecration and offering. Both worry about being touched by an impurity while doing a ritual. Both worry about little creepy things running by and creating impurity. The list of impurities from a human body has a great overlap because the human body only produces a finite number of emissions, flows, and liquids. However, Hinduism is much stricter about ordinary salvia. I am not sure how to account for both seeing leprosy/skin disease as a divine punishment. Within the karmakanda, there are two types of sins – those done intentional and those done unintentional (kamata or jnana vs akamata or ajnana) (the Hebrew equivalents would be mazid and shogeg). The unintentional sin can be undone with a recitation but intention sinning places the Brahmin outside society and possibly impure until the sin is corrected. In addition, all Hindu ritual must be done with intention. Similar to a classic Jewish distinction between intention for a command and intention about meaning and the divine, here the intention required is Samkalpa (Also spelled Sankalpa) meaning “resolve” or “intention,” as in the intention to achieve the desired goal. A person practices Samkalpa where before the performance of a ritual they vow to perform a particular practice- specifying length of time, time of day, place, etc. Although this need to vow in advance of a practice initially referred only to a spiritual practice, this has been extended in contemporary language to any such vow that requires a regular practice, such as a vow to regularly exercise. As in Judaism, vows must be verbalized and formulated precisely to show intention. In the later Purva-Mimamsa, especially the writings of Jaimini (4th century CE– Talmudic era) the efficacy of a sacrifice depends entirely on the correct performance and not on anything external. Neither intention for act nor intention for the gods matters. For Jaimini, sacrifice is an end in itself for world-sustaining and needs the needs correct performance of the priest – any ritual lapses are dangerous. If one omits a syllable is making a hole in the cosmos, it sinks the heaven bound ship. Even a mistake in the pronunciation has opposite effect. And as we know from Synagogue rules, if you recite the verse wrong it invalidates certain prayers and even if you use the wrong pronunciation or accent that change the meaning of a verse it invalidates the ritual. A major difference between the two faiths is that the karmakanda does not have a word or concept of guilt. The language is one avoiding punishment, or avoiding the vice of dishonorable or the sense of shame. We see the classic distinction between shame cultures and guilt cultures. Hasidic texts are also shame oriented and not guilt oriented. By the 8th -9th centuries CE Epic Mahabharata, were there is a greater internal sense of sin, which by the 20th century is developed into a range of internal senses of wrong doing. In the Mahabharata, unlike the Mimamsa, a direct relationship with a theistic God who watches what you do and knows your heart. “Thy heart is a witness to the truth or falsehood… You think that you alone have knowledge of your action. But you do not know that the Ancient, Omniscient one (Narayana) lives in your heart? He knows all your sins, and you sin in His presence. (Section LXXIV, Sambhava Parva) Juxtapose this to thinking about God’s knowledge of your sins on the Jewish High holy days. So what do you do for ritual mistakes in Brahmin texts? As stated in the 500 BCE Katyayana Srauta sutra: Rules for the Vedic sacrifices XXV.1.1 “for mishaps in rituals there is ritual atonement.” Prayascitti is the concept of ritual atonement, a ritual act which has the purpose of removing any mistake. For a minor mistake, then one needs to recite the purana –sukta or the “bhur, bhuvah, and sveh” or the gayatri mantra. For major ones there is an additional sin offering. In general in contemporary services, there is an extra Aarti (a waving of lamps and chant ritual) is performed after Hindus finish prayers or auspicious rituals. 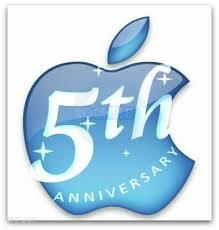 It is performed to rectify any mistakes made during the whole process and is seen as a completion of the process. Other methods used in later era for sins in general include confession, repentance, breath control, austerity, gifts to religious institutions. and pilgrimages. Pilgrimages to holy places were originally not very prominent but become more popular at a later time. Today it is one of the major religious activities. Compare it to American Orthodox Jews frequently flying to Israel. Originally one’s role as a householder was more important than going on pilgrimages, and pilgramage was a special case. Today, it becomes a family event with family penances such as hair tonsuring. If one does decide to donate to a Temple or feed the poor as a penance then one has to do it as an oath (Vratas), similar to the way Judaism considers pledge as oaths, and requires the acceptance of an oath. Think of a Kol Nidrei appeal. Adjusting to the times, new penances were made. Already in the BCE era, it was stated that “brahmans who have studied dharmaśāstra should prescribe a penance appropriate to the age, the time and the strength of the sinner; one should not prescribe an observance that will cause great distress to the sinner.” This has continued to this day. Just as Jews this season of repentance do not role in the gravel, or fast according to Hasedei Ashkenaz, or even go to a ritual bath for purity, so too contemporary penances are updated. Now a vow of money is preferred in both faiths. As a side point, the same works on sacrifice that deal with ritual mistakes and corrections, the Kalpa Vedanga 5th cent BCE, also contain the geometry of altars along with mathematical deductions for the geometry. Works corresponding to the Rabbinic tractate middot (measurements) with the measurements of building a Temple. However, the India version also contains real mathematical works that through the Arabic because our number system that replaced Roman Numerals. They had all four forms of arithmetic, the zero, geometry including squaring the circle and visa-versa, the Pythagorian theorem and estimations for pi. Another side point is that ethnographers point out how different families and groups fight over who gets which honors in the ritual and who has what share and which ethnic liturgy is used. A Temple or ghat can be sacred to competing groups with different rules and pronunciations. Except for the purists, different pronunciations, hymn choices and order of offerings are tolerated as non-mistakes. Yet, the house of worship politics is about who gets to be, or whose priests get to be, in charge for which service or part of service. By the time the boat made its way back to our starting point after a full night on the river, almost all the boatmen and the tourist trade had ended. The festivities were over. Concession lights were being closed. I walk from shore to the quiet dark streets punctuated by kids setting off fire-works at a distance. Auto-rickshaws were all home for the night. I coaxed a bicycle rickshaw driver to get me home by first accepting to only go as far the gate of the university and then once there he agreed to take me the extra kilometers home. Store keepers swept in front of their stores by kerosene lamps and moonlight. But the required festival electric lights were still burning in homes– since the required amount of time of the lights, according to most Hindu practice was to burn until midnight, some expected the lights to remain lit until day break. In the terms of the kindling of the lamps several hours earlier, most lit their lamps when the stars appeared but it was still considered acceptable to light one’s candles until midnight but not any time afterward. Think of the rules for lighting hannukah lamps. Two weeks later, I explained to my house maid (who spoke no English) to leave my burning Hannukah candles alone based on this analogy of needed to remain burning from sunset to midnight . She understood the concept. The posts that get the most hits are those about the community and not those about books, alas. Unless the post is an interview with someone infamous. Currently, most of the serious discussion has moved to Facebook and away from the comments. Time will help how much longer I keep comments. I do miss the first years of the blog when I posted 18-24 posts a month, each only a short paragraph or two letting my friends know what I was reading. Now they are all full articles but they bypass what I am reading. Onward. Whenever there is a story about Orthodoxy in the newspapers, we have grown accustomed to the article including a quote or two from Prof. Samuel Heilman giving his viewpoint on the event. For many readers, his understanding or evaluation of Orthodoxy has become the lens into Orthodoxy. Yet within the community, many do not agree with his assessments -to put it mildly. Samuel Heilman holds the Harold Proshansky Chair in Jewish Studies at the Graduate Center and is Distinguished Professor of Sociology at Queens College of the City University of New York. He received his Ph.D. from the University of Pennsylvania, under the direction of Erving Goffman. He became the first full time sociologist of Orthodoxy. Here is his website. First, a little background. The father of American Jewish sociology was Marshall Sklare whose studies on Jews in suburbia defined a generation . Sklare documented the 1950’s concern of Jewish identity despite the lack of Jewish religious observance.. Sklare’s most relevant book for this discussion was his 1955 classic, Conservative Judaism: an American Religious Movement. In the book Sklare described Orthodox Judaism in America as a “case study in institutional decay.” Orthodoxy was associated in most people’s minds with the teaming masses of non-American immigrants who were mostly poor and illiterate. Sklare devote a section to the large number of unobservant Orthodox. Sklare focuses on the acculturation of Jews based on place of settlement and considered synagogue an ethnic church acculturation. Decades ago, the sociologist Nathan Glatzer commented about Sklare “And this gives rise to sociology’s special weakness—what to do about ideas, what to do about what people think they believe?” This remains the question for many believers when they read sociology. The first serious sociology work on Orthodoxy was the 1965 essay by Charles Liebman, Orthodoxy in American Life which showed that Orthodoxy was still alive. Liebman used the sociological distinction between a Church attitude, which fosters a broad leeway of practices of beliefs, as opposed to the sectarian approach, which prescribes consistency and isolation. For Liebman, modern Orthodoxy of the post-WWII era, was a Church form of religion; Ultra-Orthodoxy was inward focused as a sect. As a sociologist, he was weak in religious ideology and openly thought it counted little. Prof. Samuel Heilman adds to this an anthropological element based on the work of Erving Goffman, who in 1959 published The Presentation of Self in Everyday Life. Goffman also uses symbolic interactionism but also introduced the theory of dramaturgical analysis which asserts that all individuals aim to create a specific impression of themselves in the minds of other people Goffman holds that when an individual comes in contact with another person, he attempts to control or guide the impression that the other person will form of him, by altering his own setting, appearance and manner. At the same time, the person that the individual is interacting with attempts to form an impression of, and obtain information about, the individual. Prof. Heilman’s first book Synagogue Life: A Study in Symbolic Interaction (1976) portrayed the noisy social camaraderie. at the core of an Orthodox synagogue. The book consciously avoids ideology and texts study and is not social history. Many confuse sociology with social history, if one wants the later then people had to wait 25 years until Etan Diamond’s 2000 book. Already in his early work, Heilman assumes that combining modernity and Orthodoxy is a hybrid and the approach leads its members to compartmentalize the two halves. It definitely described correctly the modern Orthodox synagogue of the 1960’s and 1970’s, but it did not describe the swirl of debates about synthesis by those who taught at YU or in the pages of Tradition. In the book, Torah study is done for social interaction, not for cognitive or lumdanut reasons. Here is Heilman’s fine article Constructing Orthodoxy (1981), which shows how a sociologist looks at reinterpretation, synthesis, transformation and ignoring of data by the community. A very clean example of Heilman’s sociology is “The Importance of Residence” (2002). He shows that whereas most of American Jewry is weakening its ties to residence, Orthodoxy in contrast is creating strong ties to neighborhoods. However, the article is about residence patterns not the social media gossip and hock about different neighborhoods. Samuel Heilman and Steven M. Cohen wrote a very good book Cosmopolitans and Parochials: Modern Orthodox Jews in America (1989) about Modern Orthodox congregations, of which an except is available as “Ritual Variation among Modern Orthodox Jews in the United States” (1986). The article shows that “Ritual practices which inhibit integration and are perceived to be of low religious / symbolic importance” are more likely to be neglected. In short, that ordinary people will skip minor fasts or be lax in observance. Torah uMadda types were up in arms questioning the choice of congregations and the method involved, and instead limited Modern Orthodoxy to a strictly observant heroic philosophic Modern Orthodoxy that excludes actual demographics. However, sociology and ideology are not the same thing. Sliding to the Right:The Contest for the Future of American Jewish Orthodoxy (2006), however, was too broad in considering YU, Centrism and even older views of Rav Soloveitchik as sliding Haredi, a unified fundamentalist mindset spanning from YU to Williiamsburg, The book was influenced by the mid-1990’s Fundamentalism project (see below in interview). It did not see the stronger religion of Centrism as its own unique entity that does not slide to Belz or Satmar. It was also problematic in still using a 1970 criteria by seeing college as a sign of Modern Orthodoxy when what I term “Engaged Yeshivish” had rates of college not much lower than Modern Orthodox neighborhoods. A Lakewood graduate who goes to law school does not become old-time modern. The frame analysis was cast too broadly. (Personally, I view much of the recent changes using insights drawn from the study of Evangelicals who live modern Evangelical lives). Finally, Heilman’s recent continuing work done together with Menachem Friedman on Chabad in The Rebbe: The Life and Afterlife of Menachem Mendel Schneerson is about self-presentation and social interactions. It discussed the life of the Rebbe and the sociology of shlichus. It did not provide what people wanted in terms of engagement with ideas and ideology, or the insider baseball, or the broader social history. The recent Chabad sponsored hagiography with footnotes, as if to show the account is factual or even possible, is clearly rejected by the book. Speculation on minor details in the book, especially of the Rebbe’s early life, does take away from the book. It leaves the Chabad critics ample room to dismiss the book by arguing about the smaller points. Once again, the goal was not theology or even a biography based on publications and speeches. In addition, the reception of his recent books is deeply connected to the tone of his op-eds, responses to critics, and social media comments. These interviews resulted from the Oxford Summer Institute for Modern and Contemporary Judaism, convened by Dr. Miri Freud-Kandel of Oxford and Prof. Adam Ferziger of Bar-Ilan. 1) What is your sociological method? I do not use a single methodology. When I work as a social anthropologist and ethnographer, I tend to favor participant-observation: learning by watching while doing, a method I learned from my teachers, the late Erving Goffman and Renee Fox, both of whom largely taught me while I was at the University of Pennsylvania how to turn myself into an instrument, a kind of living camera. This is better than simple observation and recording for it allows one also to share in the subjective experience of the people I am learning about, and it often enables me to ask more informed questions or notice things I would otherwise miss. To be sure there are limits on any researcher’s participation but because I am a Jew and to some extent Orthodox and many of those I have been studying share some of that culture, I bring a degree of cultural competence and insider’s understanding – verstehen, as Max Weber called it – to my task that other researchers might not. I have written about this process in a paper and later turned it into an afterword in the second edition of my Synagogue Life, in which I explore the role of native-as-stranger (the insider or partial insider looking at the world reflexively) in contrast to the more common social anthropological approach of stranger-as-native. I argue that it is easier to learn the disciplines of social science than to become a cultural insider and therefore the idea of a Jew studying other Jews (and an Orthodox one among other Orthodox) might offer more or at least different insights than a New Yorker studying the people of Samoa (as for example Margaret Mead did). Still, I realize there are limits to participation as well as to reflexivity and therefore I write copious field notes, inscribe my understanding of what I observe and participate in and then –constantly re-read my account of what I have seen and look for patterns, juxtapositions, themes, etc. Often I realize much later the significance and full character of what I earlier witnessed. My teachers Goffman and Fox, who were largely ignorant of their Jewish heritage and did not know a lot about Jews, taught me all this; I contributed the Jewish cultural understanding. Their questions about some basic Jewish things I examined taught me to always try to decipher and articulate what I took for granted and to look at the familiar in a new way. In that sense their lack of knowledge about the Jews I studied was precisely what forced me to look more deeply and I have done that ever since, imagining I am still explaining things to them and people like them. I note as many details as I can – for these are not trifles. In the process, I learn about myself as well as the people I observe. I try to suspend my own values – put them on the shelf – in order to see things from the perspective of the people I am among. It is all a complex business, and it takes time, lots of time. I also consult with others, interview, use archival materials, press reports (where available), and examine material artifacts, use recordings, photos. But as I have pointed out elsewhere, I agree with the late Clifford Geertz, understanding a culture is more like reading a poem, with ellipses, and often undefined words than it is like reading a set of instructions. When I do other sorts of sociology, I may use surveys (as I did for my books Cosmopolitans and Parochials as well as Portrait of American Jewry), interpret demographic materials, read press reports, and do more classic social science. Then the job is turning this sort of material into a narrative that is comprehensible to a broad audience but still informed by hard data. I may do secondary analysis of the work of others, informed by history and guided by new perspectives. 2) What is the difference between sociology and the amateur shul or blog schmoozing? The difference between sociology and shul schmoozing I suppose is the difference between composing music and whistling a tune. Both are musical efforts but one is structured, practiced, informed by a discipline and modeled on other work, while the whistler just repeats something heard, and often only in the most simple way. To whistle the tunes of Antonin Dvorak’s New World Symphony is not to play it as written, though there is some similarity. To be sure, Dvorak built the symphony around folk tunes that people sung or whistled (and maybe that’s why it is much loved) but he added complexity and saw connections between such tunes and the symphonic form. A good composer can make the complex seem simple and effortless, but anyone who looks at the score and understands what went into it knows how much work it was. In that way, I can take shul anecdotes and behavior (and did in my Synagogue Life) or the conduct of shul lernen (as I did in The People of the Book or The Gate Behind the Wall) and contextualize and interpret these behaviors in order to see and explain how they fit together and what they say about people that they themselves may not realize (as the whistlers of the folk tunes may not have seen the symphonic possibilities that Dvorak did) and build a narrative structure and explanatory framework. But in the end,as Dvorak and I both hope, people can appreciate and learn from what we have done without seeing the hard and complex work that went into making it. So what I write may seem simple to insiders (and often it is) but there’s a complex scaffolding that holds it all together and frames it so that I am often making the strange familiar for outsiders and the familiar strange for insiders. Making the difficult look easy is the art I try to practice. Many of the native “Samoans” I study believe that they alone understand best the entire meaning of their behavior. Moreover, as Orthodoxy has flirted with fundamentalism and its insistence on seeing things in black and white rather than more nuanced ways, it often assumes that you have to be one to know one, and that one is either ‘with us or against us.’ That makes the kind of work I do very hard to explain to contemporary Orthodox Jews of all stripes. Again and again I am asked to ‘prove’ my orthodoxy or simply defined as ‘anti-Orthodox,’ usually by the more fundamentalist elements who believe that regardless of who I am and how I do my work, I must be either for or against them. Or, as an article about me in a haredi magazine was entitled, “Professor Samuel Heilman, the Man who Loves to Hate Us.” In these criticisms, the line between studying and boosting Orthodoxy seems to be lost. 3) Have you integrated any of the new methods in your work? Anyone who has read my work can see a development and change over time. My Defenders of the Faith, which adapted the work of Levi-Strauss in his Triste Tropiques to my own travels into the heart of haredi ‘darkness’ is certainly a huge change from the way I organized my first book around the work of Clifford Geertz and his Interpretations of Culture. My work in the American Academy of Arts and Sciences project on fundamentalism, which included a number of scholars of other religions, was a group effort to find ‘family resemblances’ among different religious fundamentalisms clearly informed my Sliding to the Right. My work on death in When a Jew Dies and Death, Bereavement and Mourning, drew on a broad and developing literature of death studies and anthropological views of death applying these to Jewish custom and practice as well as my own experiences as a bereaved son. That book that blended autobiography with social anthropology was extremely innovative – maybe that’s why it won a National Jewish Book Award. 4) Do you still use the concept of Fundamentalism that drove the 1990’s Fundamentalist project? Anyone who has read my work in the Fundamentalist Project knows that I spent much time explaining how that term did not really perfectly characterize the Jews about whom I was writing. But their behavior and beliefs did display ‘family resemblances” with those who have been characterized by this term. They all responded to rapid change and uncertainty by fighting against that change, which they see as history having gone awry and see themselves as trying to put history right again. They all argue modern society and culture, particularly secular and modern Western culture, are corrupting and have failed to deliver on their grand promises of a better life. They all reject the modern west’s assertion of its supremacy and see Western influence as an ingested toxin. They all tend toward a Manichean or dualistic stance, asserting there are good and bad ways to live. You are with us or against us. If you are with us, we share a real solidarity and if not, we are ready to fight against you. They argue in favor of absolute truths, often drawn from what they view as a sacred and inerrant text, and seek to impose these on the public square: everyone must do it our way. They are often apocalyptic or messianic, seeing an end to history whose character they claim to know and which they believe will favor them. They tend to be intolerant and anti-pluralist, commonly anti-democratic. Our way and truth must be everyone’s truth and way. They generally reject the supremacy of personal autonomy and rationality in favor of received authority. They tend to subordinate women to men, and engage in selective retrieval from the tradition according with their ideological and political needs of the culture war against adversaries. Call it fundamentalism or something else, these are common elements and characteristics of some of those on the religious right whom I have studied and written about. 5) Why are you singled out with being anti-frum and out to attack Orthodoxy more than other scholars of Orthodoxy? I think I am singled out because many in the media turn to me and I tend to be quoted more often. I also may be more outspoken in having written editorials than some of the other scholars. Generally, however, the criticism comes from those who are fundamentalist-like for whom the world is Manichean. Although those who know me realize that I am quite observant personally it is easier for those who don’t to simply mark me as one who is the enemy. It is too complicated for those in the fundamentalist world to see that someone can be personally religiously observant but still view one’s world reflexively and even critically. The native-as-stranger approach necessarily means that in some sense one does become estranged from one’s native habitat, one has stopped completely ‘going native’. Yet to my critics, they assume wrongly that estrangement and a critical distance means hatred and opposition. This is the same attitude taken by those who opposed the people and questioned the patriotism of those who protested war or the lack of civil rights for all in the American 1960s or those who question policies of the political right wing in Israel today. They are called names, defined as anti-patriotic and enemies. Of course they are not. 6) How do you respond to the criticism of Marvin Schick of your book Slide to the Right? Marvin Schick admitted he never read the book before he criticized it. Marvin Schick is impossible to explain. I think he is trapped in Manichean thinking. I have told him this. But mostly I see him in shul in Jerusalem at the daily minyan where we daven next to each other, and in spite of the way I gathered information for my Synagogue Life, I don’t like to talk in shul or during the davenen . 7) Why do Chabad followers get so upset about your book on the Rebbe? How do you respond to their critiques? In writing The Rebbe, my co-author Menachem Friedman and I tried to take a man whose followers had turned him into a false messiah and turn him back into a real human being. We did not write a hagiography or a book that cited the ‘miracles’ that many of his followers attribute to him. We tried to show how he changed his life and orientation and in the process rebuilt Chabad into an outreach machine, in the process radically reforming it. The Hasidim believe their Rebbe is special and was always destined to be a Rebbe. We see him as someone who remade himself and turned what was once a very cerebral, even Litvish, Hasidism into a movement which has dumbed down its message in order to be the form of Judaism-lite that all Jews can practice, to make Judaism all about joy and goodness, and easy. I think they don’t like that insight. But people who have actually read our book (and unfortunately most Chabadnik’s have not) come away with a very positive view of the Rebbe and Lubavitchers. They are impressed that a man who lead a relatively small sect and was for at least twenty-five years in many ways peripheral to Hasidic life and concerned during the first half of his life with his own career and sought privacy could reinvent himself and his movement in such a way that even people who know nothing about Hasidism or Orthodoxy have heard of him and Chabad. And those who follow him are slowly but steadily seeking to become the inheritors of Judaism and its definitive protectors. Our readers think we have demystified the Rebbe and his movement (and I think that’s why the book won a National Jewish Book Award). To the Manicheans, however, one either praises him or damns him. Since our book is not a paean of praise, they believe it must be a book of falsehood and calumny. It isn’t. I value Chabad; the shluchim do wondrous things out of a sense of mission. But they are real people and their Rebbe was too. For those who think he was Messiah, such a conclusion is heresy. 8) What role does the Holocaust play in your thinking about contemporary Jewish life? I am the only child of two Holocaust survivors. My parents never ceased to talk about their experiences, and it shaped them and me. I am a survivor of survivors, and feel it every day of my life. My parents were Schindler Jews, but they – and especially my mother – had reservations about Schindler. God saved them, she said, not Schindler. But of course that raises the question of who was responsible for the evil. Still if my parents’ religious faith survived the Holocaust, my own would have to survive the post-Holocaust. As a child of survivors, I tend to expect catastrophe and also feel a personal responsibility for Jewish continuity. I expect that is part of the reason I have focused on understanding Jews. It has also made it important for me to be a Zionist and live as much as possible in Israel. But the Holocaust is still too fresh for me to fully understand how it has influenced me. I can say that my four sons, two of whom live in Israel and have served in the Israeli army and wife think it is built into the fabric of who I am. But you’d do better asking them how it has affected me. 9) What is most important for the future of Jewish identity? Jewish identity is dependent on Jews being among, living with, and sharing the destiny of Jewish people. Those who don’t share this existential neighborhood and consciousness do not play a significant role in Jewish identity. So the most important thing is creating and enlarging the Jewish street, the Jewish community. I see that as the essential contribution of Israel and other smaller Jewish communities and it is why I believe the future of Jewry will be mostly written there not in the wider Diaspora. That is not to say I believe the Diaspora has nothing to offer. Indeed, the real contribution of Diaspora life is its ability to allow Jews to borrow and adapt elements in their host cultures for Jewish use. That is where non-insular and contrapuntist modern Jewish life (from the Reform and Reconstructionist to the modern Orthodox) has a contribution to make. Still as a minority, all Jewish culture and identity will always be a hybrid. Even in Israel, that great concentration of Jewish life, kibbutz galuyot, the outside world seeps in and affects Jewish identity. Jews, however, who live surrounded only by non-Jews will not adapt their surroundings into Jewish identity; they will inevitably assimilate. 10) As a sociologist, you look at community and practice, not texts and theology. Can they be separated in the case of Orthodoxy? Most Orthodox Jews have never really figured out their theology. In all events, as a social anthropologist, I look at what people do and infer their beliefs from what they do. I claim no particular expertise about the texts or the theology. From what I’ve read, for example, the theology of Maimonides as expressed in the Guide for the Perplexed seems pretty far from the religiously right wing Orthodoxy I’ve observed, except for his creationism. In any case, I am a believer in the Talmudic dictum, “puk hazi” Go out and see what the people are doing. It’s too bad most of the rabbis don’t do that. They could use a little more sociology to add to their textual knowledge. I was this week’s featured cover story in the Jewish Standard. I have to thank Reb Yudel for an amazing job in his write up. The content was based on my many blog posts reporting on India. Let me know what topics would be especially interesting to develop for a general reader. The article was unable to include anything about my trip to the Temple of Tirumali that I blogged and the hair tonsuring and it did not discuss sacrifice. For those who want the original article with the wonderful photographs taken by Rabbi Robert Carroll who came to visit me, see the link here. Dr. Alan Brill of Teaneck faced his students. The classroom reminded him of British Mandate era buildings in Jerusalem. It obviously had been built in the 1940s, or at least refurbished then. All the desks had inkwells. Among the students earnestly taking notes were three Buddhist monks from Cambodia wearing orange robes; two Tibetans, one of whom looked like a Sherpa in his yak-wool vest; an Australian Christian dressed like a hippie trying to dress like an Indian, and several Indians dressed in modern clothing. Up front, wearing a traditional long golden coat, was the professor of Hindu religion and philosophy who normally taught this course. He was particularly diligent in his note-taking. The day’s topic was the Bible. That’s not a hard question for Dr. Brill, an ordained Orthodox rabbi, to answer. In fact, there are probably few Christians in America who don’t know that Jews stopped sacrificing animals nearly two thousand years ago. But in India, the question made perfect sense. After all, in Indian, animal sacrifices only ended in the early 20th century. 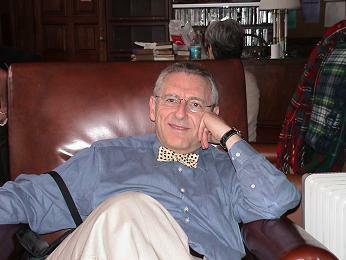 The question was emblematic of Dr. Brill’s six-month stay in India — a place where Judaism doesn’t register on the religious awareness of even the most educated, but where people’s intensely religious lives — full of household ritual, frequent prayers and hand washings, and elaborate food regulations — makes it in some ways much closer to Judaism than Christianity. Dr. Brill was in India on sabbatical from Seton Hall University, where he teaches in the department of Jewish-Christian studies. He was based in the graduate school of religion and philosophy at Banaras Hindu University in the city of Varanasi, where he had a Fulbright-Nehru fellowship, courtesy of the U.S. State Department. Dr. Brill taught an introduction to Judaism course as part of the Introduction to Western Religions course required of graduate students in the religion school. Even the course’s usual instructor had never heard of Talmud or midrash, Dr. Brill said. And he too was surprised to learn that Jews long ago stopped bringing animal sacrifices, that the practice wasn’t ended by Judaism’s 19th century Reform movement as it has been by India’s 19th century religious reformers. Wait. Animal sacrifices? Aren’t Hindus vegetarians? India is a big place With 1.2 billion people, it is the second most populous country on earth. Unlike China, the most populous, religion has not been repressed there. Instead, in India it flourishes. As of the 2001 census, 80 percent of Indians are Hindu; 13 percent Muslim (making India the country with the world’s third largest Muslim population), and the rest mostly divided between Christianity, a Western import, and the homegrown religions of Sikkhism, Buddhism, and Jainism. But what is called “Hinduism” by the West and the Indian national census is really a collection of related religious traditions with common roots and practices but great differences that are recognized by individual practitioners. Dr. Brill compares it to someone who sees Judaism, Christianity, and Islam as essentially one religion. (He met many people like that in India.) After all, the three monotheistic religions share the same theology of one God who created the world and rewards and punishes sinners; and they share many religious figures, such as Abraham and Moses. All the more so in India — with its more than 1,500 languages, representing myriad distinct ethnic groups. 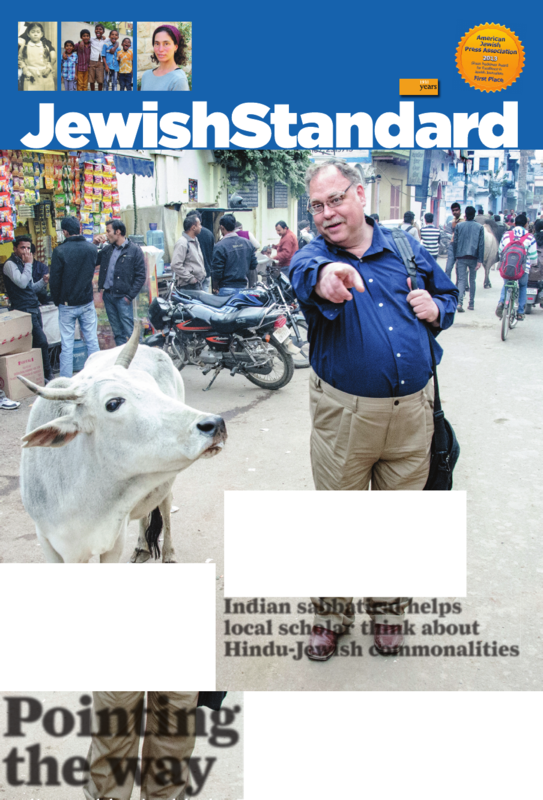 “Almost any obscure Hindu sect has more members than there are Jews,” said Dr. Brill. That includes one group, dating back to the 13th century, that pretty much adopts a Jewish-style theology of pure monotheism. Banaras Hindu University is, as its name implies, a religious college — as are, in their way, Seton Hall and Dr. Brill’s alma mater, Yeshiva University. But unlike the two small New York-area institutions, Banaras University is huge, boasting 20,000 students. It is in one of India’s holiest cities, on the banks of the sacred Ganges river, the city of a million residents that draws three million pilgrims each year — many with the belief that dying in the holy city, or being cremated on the shores of the Ganges, will prove auspicious. Dr. Brill uses an Israeli metaphor. “It’s like Bar Ilan University” — a modern Orthodox institution — “but located within Bnai Brak,” an ultra-Orthodox center. In that metaphor, Dr. Brill likens his alien presence to a Swedish Lutheran living in Bnai Brak. Another difference between the Indian institution and the American religious colleges: Conferences at Yeshiva University and Seton Hall don’t open with ceremonial offerings to busts of their founding presidents. 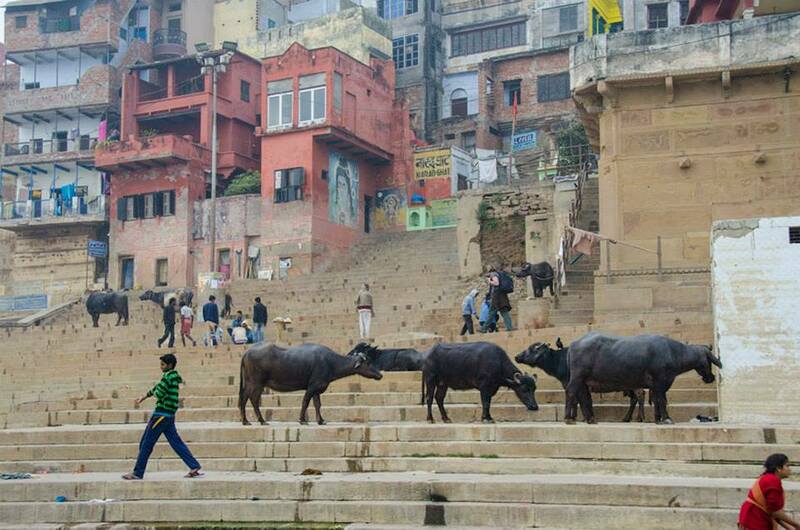 But Dr. Brill found plenty of ways in which Banaras reminded him of YU. There were the pious students who kissed their sacred Sanskrit texts, like yeshiva students kissing their Bibles or Talmuds. Some went further and also kissed their Sanskrit dictionaries, an extension of the realm of holiness Dr. Brill also has seen in Jewish circles. The pious students also paused at the doorway to touch the floor — reminiscent of the YU students who would kiss the mezuzah on the door jamb. The two holiday calendars posted on Banaras University’s website point to India’s religious diversity. The first records 17 days on which the campus is closed, including Christmas and Good Friday; four Muslim holidays whose exact date is subject to change depending on when the new moon is sighted; national holidays like Independence Day and Mahatma Gandhi’s birthday, and several Hindu holy days. A second page offers 39 secondary holidays. Employees can choose two to observe. But an observant Jew seeking to take off the 13 traditional Jewish holidays would be met with understanding, Dr. Brill believes. “They would be fine with it. There are many more regional holidays that are not on the list,” but for which practitioners take off. “Hindus do not have a Sabbath but they have at least one festival every 10 days,” he said. With that in mind, he was particularly keen to find out how his classes on Judaism would resonate with the Indian students. He was thrilled to see them catch on to subtle points. The Indian had unwittingly used Abraham Joshua Heschel’s phrase to summarize the Jewish Bible, where God speaks to humankind in a manner that contrasts starkly with the gods in Hindu scripture, who speak only to each other. “For them, yogic is not the exercise part,” Dr. Brill said. “It’s how you go from falsehood and false consciousness to regaining the truth through correcting your mind and your habits. Yoga for them is a process by which you elevate the falsehood of the human condition through philosophy, through correct ethics, and also meditation and physical discipline.” The Hebrew translation for yogic is mussar, he added. The Indian students found that some of the most esoteric ideas of Judaism were the easiest for them to grasp. “Theoretical kabbalistic discussions of whether God is separate from the world, whether the world is all God, and how God infuses the world — anything that sounds scholastic,” Dr. Brill said. “That’s what they spent their time studying. Subtle points of how does emanation work. It doesn’t matter whether it’s from a Hindu or a Buddhist point of view. They could have three other courses all on that topic. To take one example from the kitchen: “Both Jews and Hindus know that mushrooms don’t fit into the category of vegetables. The Hindus I was with don’t eat them. Jews say a different blessing before eating them. The actual practice is different, but there’s a certain common way of thinking, of always doing a taxonomy and creating a rule from it. Dr. Brill found that the Hindu practice of vegetarianism varied in different parts of India— much as does observance of kashrut in different parts of Israel. “In Jerusalem, not only is everything kosher, but everything is under good certification,” he said. “The majority of the country is keeping traditional dietary practices, even if not so strictly. But there are cities that are secular and ignore it entirely. The result is that the most prestigious restaurant chain is KFC — because many Indians feel comfortable eating American fried chicken. McDonald’s is seen as less prestigious. In India, the chain has modified its menu; instead of serving beef burgers, it serves veggie burgers, chicken burgers, and burgers made out of cheese. While Benaras is a coeducational institution, unlike Yeshiva College, still men and women cannot touch. When there was a school performance, “it was very much like a yeshiva day school play. One could profitably compare how to do shomer negiah dramatics in both faiths,” he said, using the Hebrew phrase for those who observe the traditional Jewish ban on unrelated males and females touching each other. “The lead male role in the play was given to a girl, so that she could touch and hug the heroine. A minor male role was performed by an actual male student, but the rest of the individual roles were women. The men served as a dance troupe, acting out selected events in the narrative,” he said. “And like at a day school, there was the awkward ending when the female students only received flowers and a shawl from the female dean and the male students from the male dean. “If the school was traditional, old-time Brahman, there would have been no mixing allowed. If it was fully modern then it would not have been a question” — that is likely the case at India’s secular universities. Instead, they try to walk the same tightrope as their modern Orthodox counterparts. A few words about Hinduism, monotheism, and idolatry. It’s not a surprise, then, that Jews are discomfited by Hindu religion, with its devotional statues and images dedicated to Krishna, Vishnu, and myriads of other less prominent deities. At the same time, Hindu theology had undergone its own theological shifts. If you ask an Indian about the image of a deity, whether in their home or in a temple, “they would say the image is just the way to direct your heart,” Dr. Brill said. “Everyone understand these are just representations.” . He added that Western views of Indian religion aren’t helped by the choices made by the graphic designers, who tend to put images of dancing gods on the covers of books about Hinduism. Of all of Dr. Brill’s encounters with Hinduism in India, probably the most alien was the death ritual. Like Jews seeking to be buried in Jerusalem, people come from across India to Veranasi and the Ganges with their dead. Rather than being buried, the bodies are burned. Cremation “has very exact rules,” Dr. Brill said. Another major difference ties into the diversity and its origins. On his blog at kavvanah.wordpress.com, Dr. Brill imagined a hypothetical world in which Judaism had followed a Hindu-like path from biblical times. Indians know far less about Judaism than do American Christians, even those American Christians who have never met a Jew before. At first, Dr. Brill found that ignorance to be shocking. “So, what do you think about Hitler” turns out to be a common conversation opener. For these future religious teachers and religious leaders studying at Benaras, “The whole course of Jewish history and our self-conception as a people, the Holocaust, Israel — that didn’t register. These sort of questions they put in the history department. They tend to think of religion in the abstract.